There is perhaps no greater challenge, mentally, than taking on a project that has been attempted previously but not successfully completed. This is the position a team of Fermilab engineers and physicists found themselves in more than a year ago, when Jefferson Lab, based in Virginia, came to Fermilab for help on a project: fabricating magnet coils for an upgrade to its CEBAF Large Acceptance Spectrometer (CLAS) experiment. It turned out to be a good move. In late November, a Magnet Systems Department fabrication team in the Technical Division successfully wound a full-size coil, called a practice coil, of the type to be installed in the new torus magnet for the upgrade of Jefferson Lab’s CLAS detector. Jefferson Lab’s upgraded facilities will provide scientists with unprecedented precision and reach for studies of atomic nuclei. For thousands of years, humanity has relied on light to reveal the mysteries of our universe, whether it’s by observing the light given off by brightly burning stars or by shining light on the very small with microscopes. Yet, according to recent evidence, scientists think that only about 5 percent of our universe is made of visible matter—ordinary atoms that make up nearly everything we can see, touch and feel. 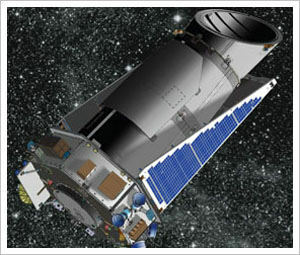 The other 95 percent is composed of the so-called dark sector, which includes dark matter and dark energy. These are described as “dark” because we observe their effects on other objects rather than by seeing them directly. Now, to study the dark, scientists are turning to what they know about light, and they are pointing to a recently successful test of experimental equipment that suggests an exploration of the dark sector may be possible at Jefferson Lab. We know that the particles of light, photons, interact with visible matter and its building blocks—protons, neutrons and electrons. Perhaps the same is true for dark matter. In other words, does the visible photon have a counterpart, a dark photon, that interacts with the components of dark matter? The DarkLight collaboration is hoping to answer that question. Peter Fisher and Richard Milner, professors at the Massachusetts Institute of Technology, serve as spokespersons for the DarkLight collaboration. Fisher was recently appointed head of the MIT physics department, and Milner is director for the institute’s Laboratory of Nuclear Science. In a recent interview, Milner said that the dark photon may bridge the dark and light sectors of our universe. “Such particles are motivated by the assumption that dark matter exists and that it must somehow couple to the standard matter in the universe. And these dark photons kind of straightforwardly could do that,” he explains. According to theory, the dark photon is very similar to the light photon, except that it has mass and interacts with dark matter. The dark photon is sometimes referred to as a heavy photon or as a particle dubbed the A’ (pronounced “A prime”). If the dark photon also interacts with ordinary matter, it may be coaxed out of hiding under just the right conditions. In fact, Milner says that scientists may have already caught glimpses of the effects of dark photons in data from particle physics and astrophysics experiments. For instance, dark photons may play a role in explaining the data in the Muon g-2 experiment (pronounced “Moo-on g minus two experiment”) that was conducted at Brookhaven National Laboratory in 2001. Muons are particles that can be thought of as heavier cousins of electrons. The Muon g-2 experiment sought to measure a characteristic of the muon related to its magnetic field. In simplistic terms, an item’s magnetic moment quantifies the strength of its reaction to a magnetic field. The muon has a magnetic moment, but, unlike your typical chunk of steel, the muon’s magnetic moment is altered by its tiny size—this alteration is captured in the muon’s so-called “anomalous magnetic moment.” When the Muon g-2 collaboration measured the muon’s anomalous magnetic moment, its collaborators were surprised to find that the number they they measured didn’t match the number they expected. “If this is real, such a discrepancy could be explained by a dark photon of the type and mass that DarkLight is searching for,” Milner says. Other evidence of dark photons may be found in astrophysics. When a measurement was made of high-energy electron–positron pairs in outer space, there were more than could be explained by production from cosmic rays, suggesting that something else, such as dark photons, produces extra pairs. “Also, there are indications from the center of our galaxy that there is radiation which might be consistent with the dark photon,” Milner adds. If dark photons are giving rise to these observed phenomena, it means that they do interact with visible matter, if ever so rarely. It also means that the effect should be reproducible and measurable by experimenters. The scientists drafted a proposal that calls for aiming the beam at the protons in a target of hydrogen gas. MIT theorist Jesse Thaler, whose group has carried out important calculations for DarkLight, proposed the name for the experiment, based on the method that will be used to carry it out (DarkLight: Detecting a Resonance Kinematically with Electrons Incident on a Gaseous Hydrogen Target). The experimenters chose hydrogen, because its atoms consist of just one proton with an orbiting electron. When the electrons from the accelerator strike the protons in the hydrogen, they’ll knock the protons out of the target. “So if we do it at sufficiently low energies, we know the final state is simple—it’s just the scattered electron, the proton and the electron–positron pair, which could come from this decay of the dark photon,” Milner explains. The experiment was approved on the condition that the collaboration could show that they were up to the technical challenges of conducting it. Milner says the main challenge was to prove that the accelerator operators could get an electron beam through the narrow hydrogen target. Even though the electrons in the beam would have low energies, the beam would have a lot of them, amounting to 1 megawatt of power. That much power would destroy any container used to hold the hydrogen gas. 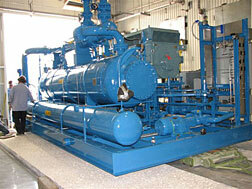 The experimenters decided that the gas would be pumped into a narrow pipe. The electrons would then be threaded into that same narrow pipe. At its narrowest, the pipe would need to be about 2 millimeters wide and 5 centimeters long, which is roughly the size of a round coffee stirrer. “We decided that we really needed to do a test with a beam. So, we basically built a system, a test target system that had basically a mock-up of apertures, 2-millimeter-, 4-millimeter- and 6-millimeter-diameter apertures, in an aluminum block. And we brought it to Jefferson Lab about a year ago. And in late July, we had a test,” he says. The staff at MIT-Bates Research and Engineering Center designed, constructed and delivered the test target assembly. 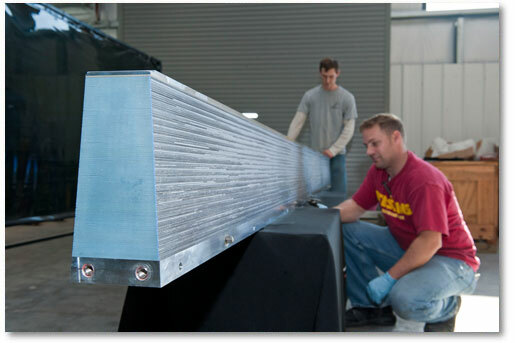 The Jefferson Lab accelerator operators and a team from the DarkLight collaboration attempted to thread the electron beam through the narrow pipes in the aluminum block, successfully threading the beam through the 6-millimeter, then the 4-millimeter, and finally the 2-millimeter mock targets. What’s more, the electrons in the beam passed through the pipes cleanly. In the case of the smallest aperture, 2 millimeter, the operators threaded the electrons through the pipe continuously over a period of seven hours; in that time, only three electrons were lost as they struck the walls of the pipe for every million that passed cleanly through. “So, it’s a very powerful beam, it’s a very bright beam, but it’s also a very clean beam,” Milner says. With this successful test, the DarkLight experiment has been approved for running. 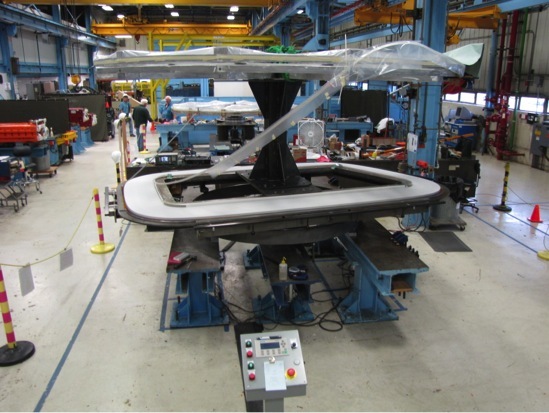 Milner says the collaboration has a lot of work ahead of it before it can run the experiment, including building the detectors that will be used to capture the protons, electrons and electron–positron pairs, and finalizing the target. In the meantime, there are also other hunts for dark photons that are preparing to run at Jefferson Lab. 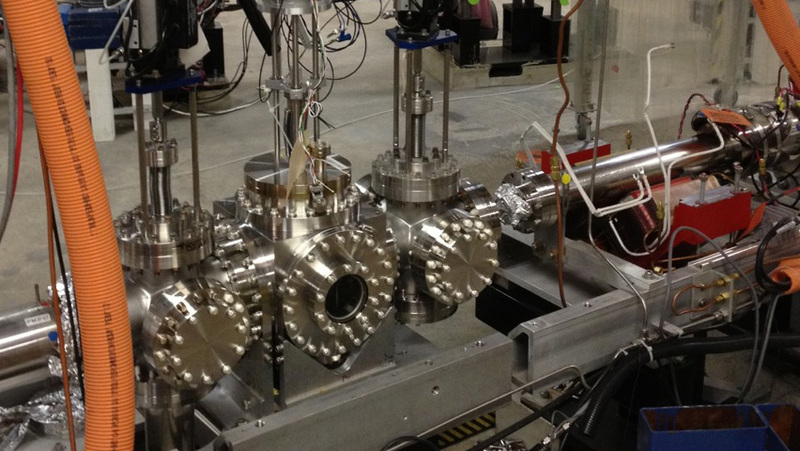 Two of these experiments will be powered by the same accelerator. 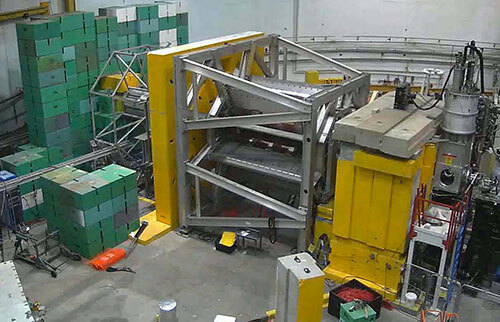 The Heavy Photon Search is preparing to run in Jefferson Lab’s Experimental Hall B, and the APEX experiment will be carried out in Experimental Hall A. Researchers have made the first experimental determination of the weak charge of the proton in research carried out at the Department of Energy’s Thomas Jefferson National Accelerator Facility (Jefferson Lab). The results, accepted for publication in Physical Review Letters, also include the determinations of the weak charge of the neutron, and of the up quark and down quark. These determinations were made by combining the new data with published data from other experiments. Although these preliminary figures are the most precise determinations to date, they were obtained from an analysis of just 4 percent of the total data taken by the experiment, with the full data analysis expected to take another year to complete. Q-weak at Jefferson Lab has measured the proton’s weak charge. No image credit. The weak force is one of the four fundamental forces in our universe, along with gravity, electromagnetism and the strong force. Although the weak force acts only on the sub-atomic level, we can see its effects in our everyday world. The weak force plays a key role in the nuclear reaction processes that take place in stars and is responsible for much of the natural radiation present in our universe. The Q-weak experiment was designed by an international group of nuclear physicists who came together more than a decade ago to propose a new measurement at Jefferson Lab. They proposed the world’s first direct measurement of the proton’s weak charge, denoted by the symbol “qyw” represents the strength of the weak force’s pull on the proton, a measure of how strongly a proton interacts via the weak force. Since the weak charge of the proton is precisely predicted by the Standard Model, which is a well-tested theoretical framework that describes the elementary particles and the details of how they interact, it is an ideal parameter to measure experimentally as a test of the Standard Model. See the full article here, and there is much more. “If you’ve ever heard the thunderous sound of a sonic boom, you’ve experienced the shock waves in the air created by an object traveling faster than the speed of sound. But what happens when an object travels faster than the speed of light? Photo courtesy of Jefferson Laboratory. At Jefferson Laboratory, construction is underway to upgrade the Continuous Electron Beam Accelerator Facility (CEBAF) and the CEABF Large Acceptance Spectrometer (CLAS12) at Hall B. During the experiments, the accelerator will shoot electrons at speeds faster than the speed of light, creating shock waves that emit a blue light, known as Cherenkov light — this light is equivalent to the sonic boom. By recording data from Cherenkov light, scientists will be able to map a nucleon’s three-dimensional spin. The device will use 48 ellipsoidal mirrors assembled into one circular, 8-foot diameter mirror to capture this light. Pictured here is the web-like component that will support the mirrors in the accelerator itself. 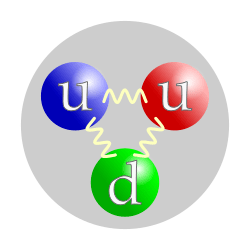 “A successful measurement of the distribution of quarks that make up protons conducted at DOE’s Jefferson Lab has found that a quark’s spin can predict its general location inside the proton. Quarks with spin pointed in the up direction will congregate in the left half of the proton, while down-spinning quarks hang out on the right. 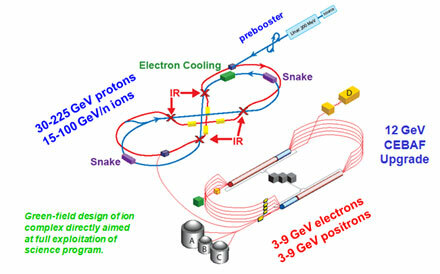 The research also confirms that scientists are on track to the first-ever three-dimensional inside view of the proton. According to Harut Avakian, a Jefferson Lab staff scientist, these observations have so far revealed important basic information on the proton’s structure, such as the number of quarks and their momentum distribution. This information comes from scattering experiments that detect only whether a quark was hit but do not measure the particles produced from interacting quarks. ‘If you sum the momenta of those quarks, it can be compared to the momentum of the proton. What scientists were doing these last 40 years, they were investigating the momentum distribution of quarks along the direction in which the electron looks at it – a one-dimensional picture of the proton,’ he explains. “As the U.S. sweated through its warmest year on record outside, a testing chamber at NASA Johnson Space Center in Houston reached its coldest temperatures yet on the inside, cooled by one of the world’s most efficient cryogenic refrigeration systems. 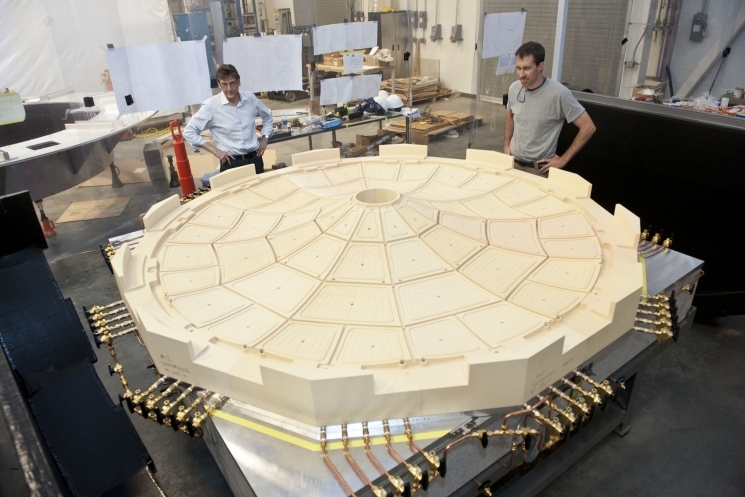 Designed by members of the Cryogenics group at the Department of Energy’s Jefferson Lab, the system reached its target temperature of 20 Kelvin, about -424 degrees F, for the first time in May 2012 and again during commissioning tests in late August. It reached its target temperature in just over a day and maintains a steady temperature with less than a tenth of a degree in variation over a load temperature range of 16 to 330 Kelvin, all with no loss of helium and using half the liquid nitrogen than comparable systems. But what is even more remarkable is its ability to maintain design efficiency down to a third of its maximum load. Researchers from the University of Regina and the Thomas Jefferson National Accelerator Facility (Jefferson Lab) in the United States, along with provincial and federal government representatives celebrated the completion of a significant milestone today in the international physics project called GlueX. Researchers in this experiment are looking to answer one of the most fundamental questions in science today: Why does matter stay together? University of Regina researchers have developed, constructed and recently delivered the largest and one of the most critical components of the project – the $9 million barrel calorimeter (BCAL), which will be installed in Jefferson Lab’s Hall D and used to study the interaction of quarks, the basic building blocks of matter, in the GlueX project. The United States Department of Energy (US DOE) has classified the GlueX project as a Discovery Potential experiment meaning that it has Nobel Prize-winning potential. One module of the 48 that were developed and constructed by approximately 60 researchers at the University of Regina. The entire system contains more than 750,000 optic fibers that channel light along their 3.9 meter length to detectors that amplify the light so it can be digitized and measured. The recent deficit super committee debacle in Washington means possible debilitating budget cuts to your D.O.E labs and NASA missions. Please get ready to write, email, phone, your congressional representatives and senators. It’s your tax dollars, folks. All of the other missions, current and future. Everything is at risk. The U.S. future as a leader in basic scientific research is at risk. Remember the Superconducting Super Collider? Killed off in 1993 by the dimwitted (then Democrat dominated) Congress? The tax dollars are yours. 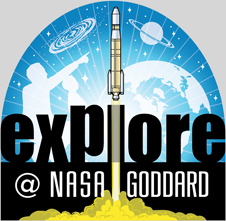 Visit the D.O.E lab and NASA mission web sites. Look around. See if you think that these are worthy of your tax dollars. Read back through past entries in this blog, you will see that it is not all High Energy Physics, Astronomy, and rocket science. It is also Biology, Chemistry, Medicine, Genetics, Clean and Renewable Energy, Ecology, Climate, you name it, our great labs and NASA missions are there to help make our lives better. “Plants face all kinds of stress. Bugs chew on them, they get fungal infections, and they can get too hot or cold. So how do plants respond to stress? Members of Jefferson Lab’s Radiation Detector and Imaging group are helping researchers at Duke University find out. While a plant’s overall health can often be determined through simple observation, researchers sometimes need to see what’s happening on the inside. That’s where Jefferson Lab group leader Drew Weisenberger and his colleagues come in. They are working to develop tools that can image inside plants. 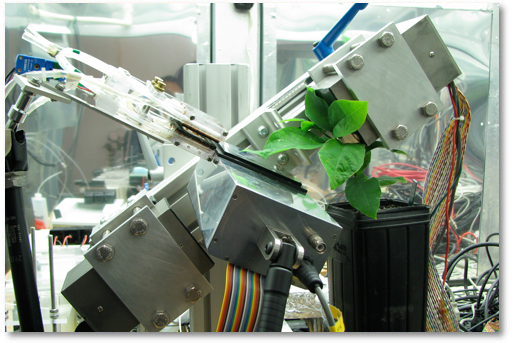 The PhytoPET and PhytoBeta imaging systems let biologists see inside plants.